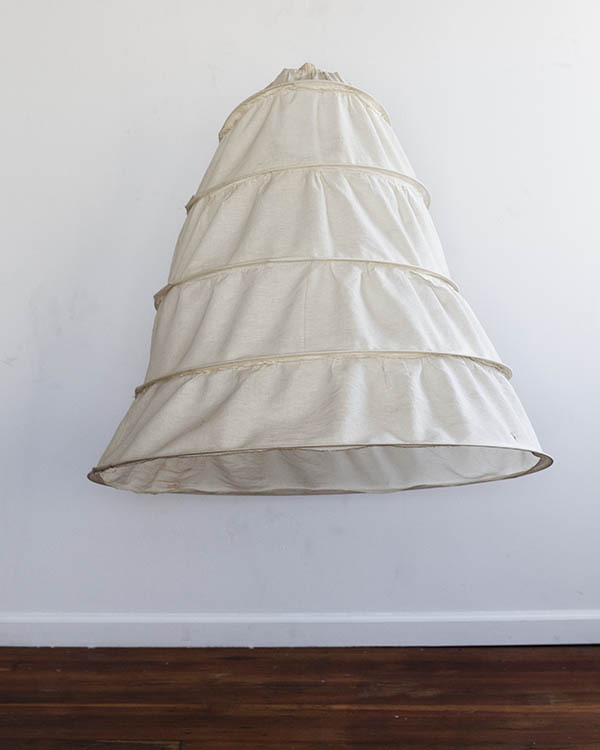 HOOP series explores abstract architectural properties of the hoop skirt, a clothing item with curios geometric form that we can classify as “flexible cone”, a form that appears both in nature and in the world of artifice: flowers, bells, horns, nuclear power plants, tower roofs, skirts, hats etc. However, hoop skirt is really an augmentation device, a skeletal extension supposed to alter the visual perception of human form. To realize the full associative power of this archetypal shape we have to place it in dynamic relationship with human body. The way of imaging we often paradoxically call “objective” tends to dispose with apparent reality of objects, taking us closer to the mystical world of visual associations. Minimalistic setting, uniform lighting and central vantage point helps with the shift in perception, from trivial reality to metaphysical one. The intent was to induce spectator to spontaneously alternate between the three separate aspects: visual sensation of human form, symbolic function of the skirt and the more abstract geometry of the flexible cone. Executed in June 2010 in two 3-hour sessions with the figure-drawing model and dancer Shawnrey Notto. Inspiration for this project came from a large collection of life drawings of Shawnrey I made in San Francisco during 2009. 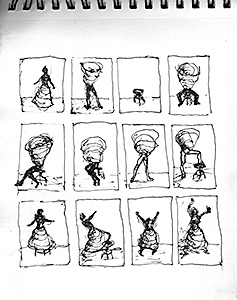 See storyboard with preparatory sketches and photograps.